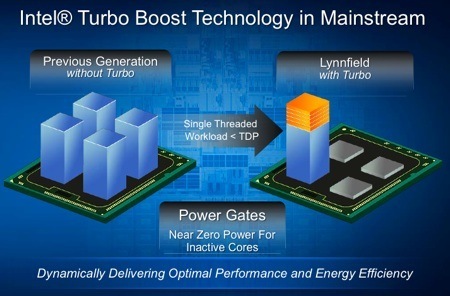 Intel has enhanced the Turbo Boost feature for Lynnfield and this is worth a closer look. Turbo Boost is a dynamic overclocking tool that increases the clock speed when the CPU is under load, so long as it continues to operate inside its thermal limits. The i7 900 made limited use of Turbo Boost and only raised the CPU clock speed by one step of the 133MHz base clock for all four cores, or two steps if the software was thrashing one or two cores. In other words, a 2.66GHz Core i7 920 would accelerate to 2.8GHz on all four cores or 2.93GHz on one or two cores. This is a welcome increase, but the vast majority of enthusiasts who lay out the cash for Core i7 900 will surely want to overclock way beyond that point. Lynnfield increases the impact of Turbo Boost by bumping the clock speed of all four cores of a 95W TDP CPU by two steps (266MHz) when the CPU is under load. If the software you are using only takes advantage of two processor cores then Turbo Boost can increase the clock speed by another two steps: 533MHz above the standard speed. If you are only using a single core, Turbo Boost will raise the speed by a total of five steps, or 666MHz. This means that Intel will dynamically overclock our 2.93GHz Core i7 870 to 3.2GHz on all four cores, 3.46GHz on two cores, or 3.6GHz on one core. The low-power 82W TDP Lynnfield CPUs have another trick up their silicon sleeves. Turbo Boost will raise the clock speed of all four cores by a single step, but two cores can run a further five steps faster, and one core can go another step faster for a total of seven steps, or 933MHz. We were sent a Core i7 870 sample with a clock speed of 2.93GHz and a stock Intel CPU cooler. The Core i7 900 has a hefty maximum TDP of 130W that covers the whole family from Core i7 920 to 975 Extreme, while the first Lynnfield CPUs will have a TDP of 95W. This is a welcome step but Intel annoyingly set the LGA1156 cooler mounts are just a couple of millimetres closer together than the ones on the LGA1366 socket.